Welcome to the Keweenaw – or as the Native Americans referred to it as “the crossing place”! 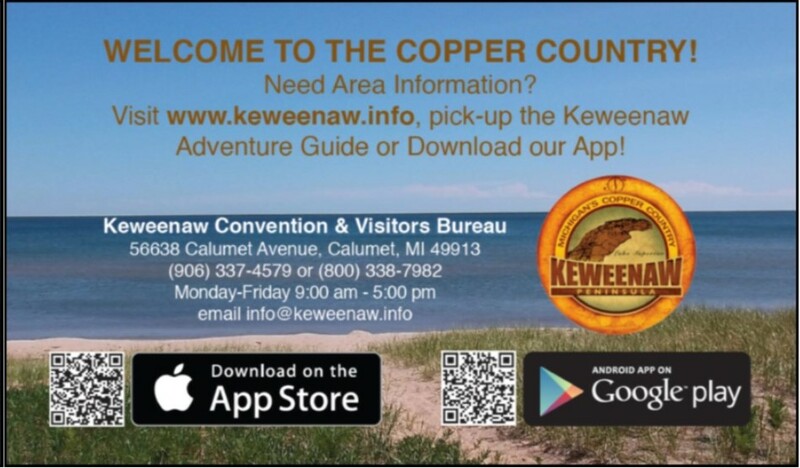 We hope you will consider visiting the beautiful Keweenaw Peninsula and come back many times to the Copper Country. As for lodging, visitors have a variety of options. The area has numerous types of hotels to serve visitors. For those looking to spend a night enjoying the outdoors, campgrounds are located throughout the Keweenaw Peninsula. The areas selection of restaurants should satisfy everyone’s taste. There are ethnic restaurants with Finnish, American, Italian, Chinese, and Mexican cuisines. A variety of fine dining, fast-food and chain restaurants are located throughout the Keweenaw. There are a variety of choices for shopping including an indoor shopping mall, numerous retail centers, big box retailers and small boutique stores. You may need a rest from shopping during your stay in the area. There is a wide array of entertainment, arts and recreation, museums, cultural events, music festivals, bike trails, golf and many more!